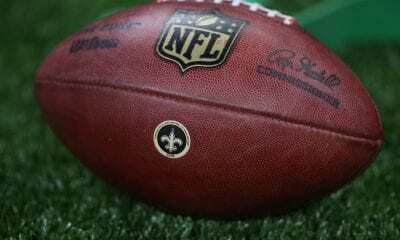 It’s a good thing the Kansas City Chiefs had a week off following their exhausting defeat to the Los Angeles Rams. All that running and passing and scoring. It tired us all out. 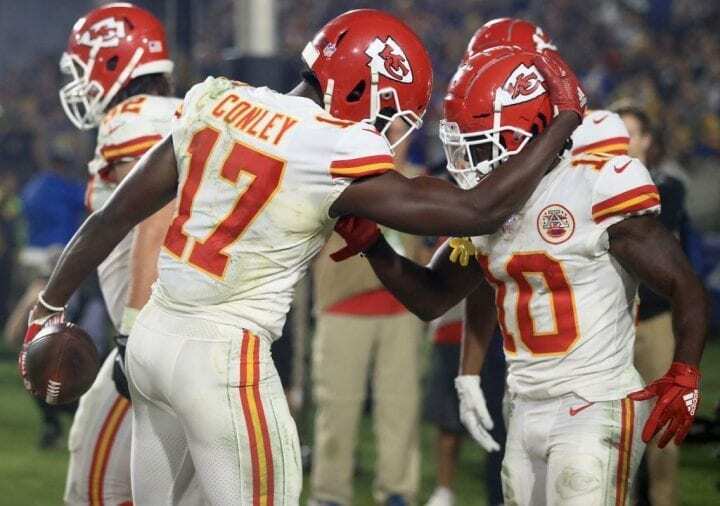 Even though they lost, Tiebreaker.com still adores the Chiefs enough to keep them on top of our AFC power rankings. But if the defense doesn’t stop someone soon, we might be tempted to break off our love affair. It’s been great fun watching Pat Mahomes, Kareem Hunt, Tyreek Hill and Travis Kelce play with the football. Wow, 404 points! But here’s the thing: The Chiefs (9-2) lead the Los Angeles Chargers by only one game in the AFC West and they play again in Los Angeles on Dec. 13. We’re not saying the Chiefs are suddenly vulnerable. We’re just suggesting they keep one eye open. 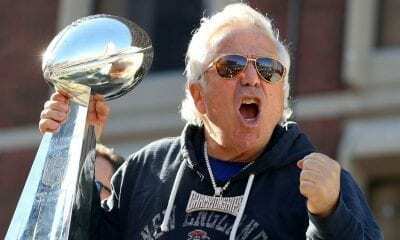 When the day comes – and we know it will – when the Patriots let Sony Michel leave in free agency, sojmeone remind The Hoodie it was 2014 when the last Pats halfback gained as many as 133 yards rushing in a game, as his rookie did last week against the New York Jets. Or that the 2018 Pats are 3-0 when Michel gains at least 100. No matter. The Pats have tiebreakers over the Chiefs and Houston Texans. The playoffs are coming to Gillette Stadium once again. In case you are wondering, the 1998 Buffalo Bills were the last team to start the season 0-3 make it to the playoffs. And in case you didn’t know, the 1925 New York Giants were the last team to win seven straight after starting 0-3. And now the Texans have won eight straight. We don’t know what might scare their opponents more right now, their fearsome defensive front or a running game, led by Lamar Miller, that gained 281 yards on Monday against Tennessee. We have a prediction: If Phillip Rivers starts each of the remaining five games by completing his first 25 passes, like he did last week, the Chargers likely will win the AFC West and set up a possible LA-LA Super Bowl. We also have another prediction: With Melvin Gordon on the shelf with a sprained MCL, and the angry Pittsburgh Steelers coming next on the road, Rivers might just have to do that. Ben Roethlisberger has thrown five interceptions in the last two games, the most ill-timed with 1:04 remaining in Sunday’s 24-17 loss to the Denver Broncos, the Steelers sitting third-and-goal at the Broncos 3. Earlier this week, Big Ben went on his weekly radio show and kind of threw Antonio Brown, rookie James Washington and offensive coordinator Randy Fitchner under a double-decker for their alleged missteps along the way. So now we know for certain: Big Ben is the alpha male in that locker room. Look at how far the Colts have jumped in the AFC power rankings! All the credit goes to Andrew Luck, without question the NFL’s comeback player of the year. 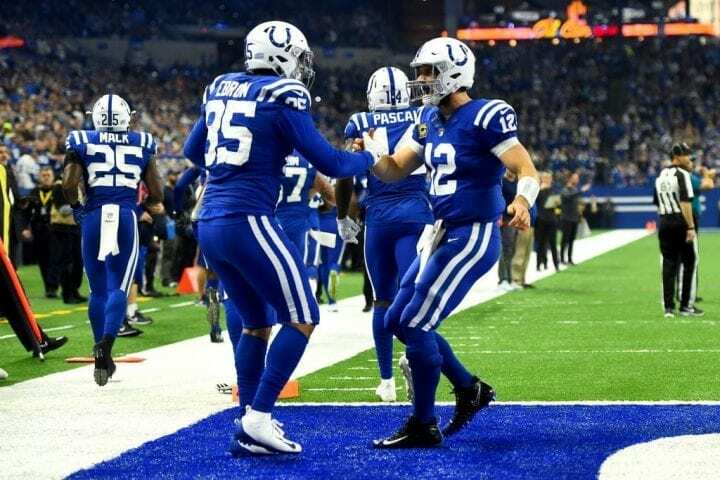 The Colts have won five straight, mostly because their offensive line, which opened its gate for a league-leading 56 sacks last season (Jacoby Brissett took 52 of them), has packed Luck in bubble-wrap. That has given him time to toss 32 touchdown passes. So why in name the name of Sam Havrilak is Frank Reich taking chances by turning Luck into a receiver? Stop it! Right now! After watching Lamar Jackson run for 190 yards on 37 carries in his first two starts, Michael Vick, the archetypal running QB during his 13-year career, offered the rookie a note of caution. Vick doesn’t want Jackson to dull his vibe. He just wants to remind him danger lurks beyond the line of scrimmage. Here’s the thing: The Ravens (6-5) have rode Jackson’s energy to a two-game winning streak. And there’s a Wild Card berth to be won. Run, Lamar, run. During the last two weeks, the Broncos have resurrected their season, and perhaps the career of coach Vance Joseph, by taking down the Chargers and Steelers. At 5-6, they are now tied with Cincinnati, Tennessee and Miami, one game behind the 6-5 Colts and Ravens for the second AFC Wild Card. But look at this: Denver plays at Cincinnati, at San Francisco, at home against the Cleveland Browns, at Oakland and home against the Chargers. Looks like a possible playoff run to us. 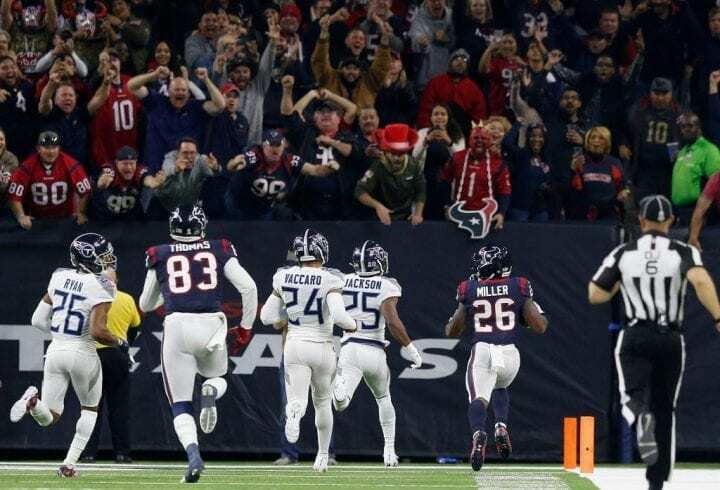 We mentioned earlier their defense allowed 281 yards rushing to the Texans, including a 97-yard TD gallop by Miller, not exactly a good Monday Night Football look. After beating the Patriots on Nov. 11, the Titans have allowed 72 points to the Colts and Texans. But on to more pleasant news. Marcus Mariota completed 22-of-23 (including his first 19) for 303 yards and two TDs against the tough Texans defense. His 95.7 completion percentage was the second highest in league history. Just his luck that Rivers connected with 96.6 percent on Sunday. Oh, and the Titans play the Jets on Sunday. We think Ryan Tannehill is OK as starting QBs go. We know he’s not Dan Marino or Bob Griese. But he’s not exactly Chad Henne or David Woodley, either. There are a lot of NFL teams that would take him right now, no questions asked. We just don’t know if he has any tread left in South Florida. Listen, all it takes to compete in the AFC East is a heartbeat and one or two breaks against the Patriots. And the Dolphins are 5-6, even though Tannehill missed a few weeks with an injury. How would Derek Carr look with a fish on his helmet? We are not here to disparage the Bills. Nope. Not us. They have won four games despite a minus-111 point differential that’s better than only Arizona’s minus-138. They have a fine young QB in Josh Allen that his teammates seem to love. They play with great spirit despite coming off a playoff berth in 2017 with another losing season. And they did beat the Minnesota Vikings by 21 points and the Jacksonville Jaguars, both conference finalists last season. Buffalo is not extinct, just in the process of breeding. The Browns beat the Bengals last week for their first road win in three years. They have now won consecutive games for the first time since 2014 and at 4-6-1 are exponentially better, in every area, than they’ve been in a very long time. Although he tends to be a little smug at times, Baker Mayfield – unlike DeShone Kizer, Cody Kessler, Johnny Manziel and Robert Griffin III – talks and plays like a winner. And we love winners here at Tiebreaker.com. But let’s not get carried away and make Gregg Williams the fulltime head coach. Think offense. Leonard Fournette had already missed six games (hamstring) and an offense so dependent on his running ability has suffered because of it. 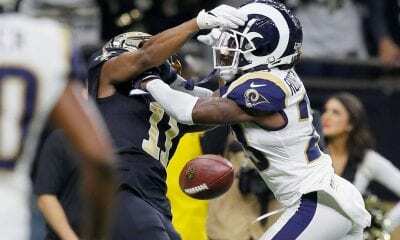 Then on Sunday against the Bills, a winnable game, he gets thrown out for fighting, incurring a suspension that will keep him out of Sunday’s game against the Colts. Of course, the Jags lost their seventh straight, fired their offensive coordinator on Monday and replaced Blake Bortles with Kessler, who is 0-8 as a starter. You can’t make it up. While we await word about who will be the next coach of the Jets, the franchise continues to circle, their rise in the AFC East stunted again by the head winds of another dysfunctional season. But let’s not second guess the front office. Sam Darnold is still the QB of the future. How do we know? Christian Hackenberg has been allocated to the Memphis team in the Alliance of American Football, which begins play on Feb. 9. Who said the Jets don’t know talent when they see it? As bad as they’ve looked on the field, the Raiders still look great on the field. Let’s face it, the silver and black still looks boss (a 1960s term for Gucci), still nosing out the iconic green and yellow of the Green Bay Packers. Did we mention they are 2-9 this season? Well, you can’t have everything. Just wait until Jon Gruden gets his hands on those three No. 1 draft picks in 2019. That’s when fashion will take a back seat to fortune.